Stems: Erect or ascending, slender, usually several, rarely branched, angled, glabrous. Leaves: Alternate, simple, sessile, narrowly oblanceolate below to linear above, 1/4 to 1 inch long, less than 1/10 inch wide, glabrous; margins entire, sometimes curling under; lower leaves often clustered. 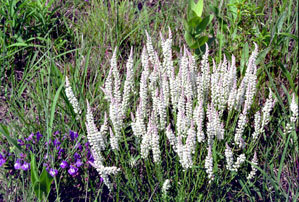 Inflorescences: Racemes, spike-like, 1 to 3 inches long, tapered toward tips, terminal, on long stalks. Flowers: About 1/8 inch long, white with green centers; sepals 5, 2 lateral sepals larger and petal-like; petals 3, rounded, united into tube that is split on back and fused with stamens; stamens 8. Fruits: Capsules, elliptic, 2-seeded; seeds tiny, dark, silky-hairy. Habitat: Dry, rocky or sandy prairie hillsides, ravines, and thickets. Uses: Native Americans used the roots of white milkwort to treat earaches. Comments: The name "milkwort" comes from an ancient belief that nursing mothers could increase lactation by eating plants of this genus.